Another side. I like this one. I think you have two trees there. You my have to split the roots, but there actually may be two plants in the pot. 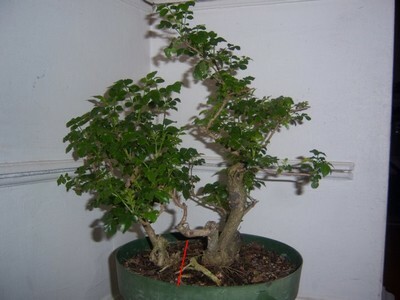 At any rate, I don't think the right and left sides go too well together as a bonsai. You are aware that the Cape Honeysuckle is NOT a honeysuckle?? It is a Begonia. Jim, I didn't know it was a begonia.!! I was thinking the same thing about possibly having 2 trees here. I wont truly know until it gets a little warmer and I'm able to mess around a bit. Thanks for your time and efforts Jim. Hi Joe - Jim is almost right, your plant is Tecoma capensis in the Bignoniaceae, the same family with our native Catalpa and Trumpet vine. It is not however a Begonia, but like most Begonias it is tender to hard frost so be certain to protect it in winter. They love heat and will reward you in summer with bunches of bright orange trumpet-shaped flowers. I've grown many of these when I lived in the desert southwest, (they will not thrive in San Francisco's cool summers where I live now) but I usually treated them as flowering shrubs rather than bonsai, since they are prone to long rangy growth and only flower on new growth. Sorry to intrude. This is a test. Yes this identification seems to fit much better. It is very helpful. It is currently living out the rest of the cold season in doors. -- Thanks David! I've inspected the tree a little further. I do not think I will be able to get a second tree out of this without some severe separation in the root ball or to a shared tap root. I might want to look at creating a "clump" like style or some sort of "group" for this. I will not be doing any changed until the temperature is warmer. Prior to my ownership it was in a regulated green house with 80% humidity ( it seemed) and temperature in the 80's. So I'm a little nervous doing anything drastic at this time. Anyone wanna attempt a photoshop?? Yes it is a Bignonia or cross vine syn Doxantha if it is B.radicans it would also be known as Campsis radicans or B.Jasminoides it is Known as Pandorea jasminoides. It will grow like mad if happy and the flowers may be big but wouls be fun to have a go. I've inspected the tree a little further. I do not think I will be able to get a second tree out of this without some severe separation in the root ball or to a shared tap root. I'd wait to do anything until mid to late spring, but you will have to cut the taproot off anyway. I'd bet that if you sawed the tree at the red line, you would find that there would be quite a clump of fine roots under the left-hand section -- which looks to me like it may have the most bonsai potential of the two halves, though both will be fine. I don't like the right side and left side leaning away from each other if left together. Thanks for the advice. It's always very valuable.